(Manama) – His Royal Highness Prime Minister Prince Khalifa bin Salman Al Khalifa praised the good reputation of the Bahraini judiciary and its impartiality at the GCC, Arab and international level. He said ensuring justice and sovereignty of the law is the goal in Bahrain under the leadership of His Majesty King Hamad bin Isa Al Khalifa. 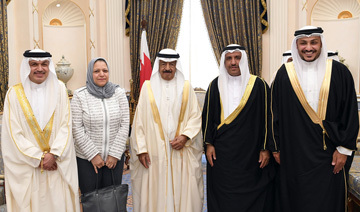 He commended the royal keenness to develop the judicial system in Bahrain and boost autonomy of the judiciary by adopting ambitious strategies to modernise the judicial branch and boost national competencies. HRH the Prime Minister was speaking as he received at Gudaibiya Palace today President of the Cassation Court and Deputy Chairman of the Supreme Judicial Council Chancellor Abdullah bin Hassan Al Buainin, Cassation Court Undersecretary Chancellor Masuma Abdelrasoul Isa, President of the Legislation and Legal Opinion Commission Chancellor Nawaf Abdullah Hamza and Vice President of the Legislation and Legal Opinion Commission Chancellor Mohammed Ahmed Meqbel on the occasion of their appointment to their new posts. HRH the Premier congratulated them on the royal trust to continue their role in serving the nation, praising their wealth of experience and competence in the judicial field and wishing them every success in assuming their national responsibilities. He hailed the achievements of the judicial branch in boosting justice and the rule of law which represented the main guarantee to fostering security and stability and fast-tracking development. The President of the Cassation Court and Deputy Chairman of the Supreme Judicial Council Chancellor, the Cassation Court Undersecretary, the President and Vice President of the Legislation and Legal Opinion Commission expressed thanks and gratitude to HRH the Premier for his support to national competencies, praising the ongoing development of the judicial field in Bahrain to further promote its role in protecting rights and freedom and contributing to the kingdom’s comprehensive development march.